The sparrow beats a hasty retreat. When a Harris's Sparrow tries to move in on the suet feeder the woodpeckers crown flashes and the sparrow yields quickly. 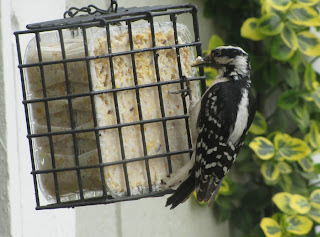 Both the male and female Downy Woodpeckers are regulars at the suet feeder. They never seem to visit at once but take turns. 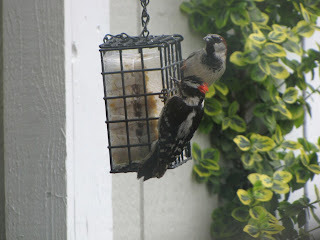 It is the male that has the red crown. I had a picture of the female a few days ago. As I am writing this the rain is pounding down and making such a racket on the roof of the garden room that Sue and I are shouting to make ourselves heard. This is the third day of heavy rain. It stops for an hour or so then starts back up again. We had a dry winter so this is not unwelcome. Colors are soft and muted. The gullies become little rivers. 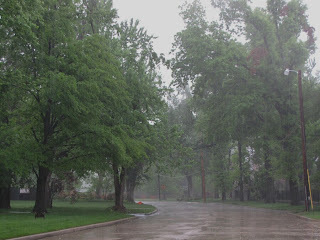 The street disappears in a curtain of rain. It has rained all morning and all afternoon. 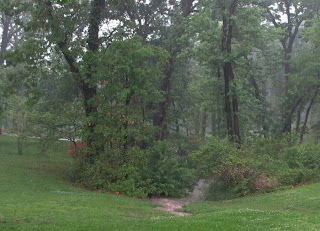 The rain began last night with a good deal of thunder and lightning. Smokey, who is frightened by storms, has stuck to me like glue and shivers constantly. When the rain begins to pound on the roof he pants. Poor fellow. I have always enjoyed thunderstorms. 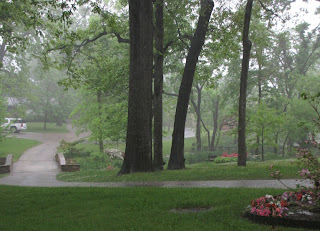 I love to sit under a porch out of the rain and watch it pour down just beyand my reach. When I was a little kid thunderstorms never woke me up, but my mother would come in and wake me to ask if I was OK. Then she would say that since I was awake I was to keep her company because she was frightened. I never understood that, but Smokey understands. A friend whose blog I enjoy has challenged me to respond to a series of questions about books and my reading habits. OK, here goes. Do you fold the page corner or use a bookmark? I use a bookmark although it is usually a scrap of paper or whatever is at hand. I have some nice bookmarks but I don't know where they are. Have you ever received a book as a gift? Yes, but gift books are often "nice" books that live on the coffee table but don't get read. Do you read in your bathroom? No. It is not convenient to read while in the shower. Not seriously. I write poetry and have self published some chap books but very few are worth reading. What do you think about series of books? When I was a kid I read all of E. Frank Baum's OZ books - there are a dozen or so. I think I read all of C. S. Forester's Horatio Hornblower series. I have read a lot of John LaCarre's spy books although they are not really a series. I can't imagine a more successful series than Harry Potter. I loved those. I think I read most of John Updike's "Rabbit" books. I read "Ender's Game" and got hooked on Orson Scott Card's "Ender" series and the "Bean" series which followed. They get windy but I was interested in the characters. That's enough. Is there a book you worship? Not really. I read the bible regularly but I don't worship it. Maybe I don't understand the question. Would you like to meet the authors? It would be interesting to hear some authors talk about their books but I have no burning desire to meet them. Authors, artists, musicians, I am interested in the work, not the person. Maybe if I know too much about the artist it might interfere with my ability to enjoy their work. After watching Tom Cruise jump up and down on Oprah's sofa I have trouble enjoying his movies. Do you talk about your reading? My wife and I will talk about things we have read, especially if we both have read it. I enjoy talking about books but do not find many occasions to do so. Not many literary minded friends. How you choose your books? At one time I belonged to a mail order book club which resulted in a substantial collection of unread books. I read what is well reviewed and looks interesting, or the next book of an author whose last book I enjoyed, or what is recommended by a friend. In a comfortable chair or stretched out on my bed. What is the ideal book? Some books catch your attention and pull you through to the end. At the end of each chapter is a little hook that compels you to read into the next. Would prefer to watch TV, play a video game or read a book? If I am eating alone I might read a newspaper or a magazine while I eat, but seldom a book. Sometimes, if the music is not intrusive. Silent if I am trying to concentrate. No. I have an iPhone and can read books on it but do not. Email or short things are ok but not a full length book. I can't imagine buying a Kindle. Do you like borrowed or purchased books. It makes much more sense to read a library book than to purchase one. But I more often buy the books I read. For one thing I tend to jump around and my library books usually end up overdue. Besides I am something of a collecter and if I enjoy a book I like to keep it around. A lot of my books come from Amazon.com and the used books are often a bargain. What is the book that you are reading now and what is next? For a study group I am reading "The Book of Creation: An Introduction to Celtic Spirituality" by J. Philip Newell, for fun I'm reading "Me Talk Pretty Someday" by David Sedaris. Next I plan to read "A Thousand Splendid Suns" by Khaled Hosseini. I read a lot of poetry, and just bought "The Shadow of Sirius" by W.S. Merwin. Have you ever abandoned a book? Many times. I will give it about 25 pages. If it bores me it is over. What is the first book you really loved? When I was very young I remember "Raggedy Ann and Raggedy Andy", and "Babar" about an old lady with an elephant. There were others but it is hard to remember back that far. Thank you for staying with me. If you have a blog, consider yourself challenged. 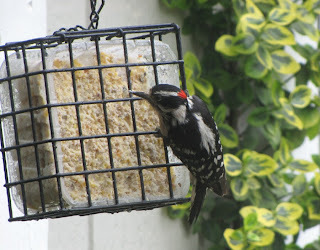 The little Downy Woodpeckers are one of my favorite birds to visit my feeders. Dressed smartly in black and white, they are all business. They jump in, gobble down a bite to eat and then off they go. Pretty little things. These photos were sent to me by my cousin Glenda in North Carolina. She had a nest of sparrows in a wreath she had hung on her front door and has been carefully slipping in and out of the door for weeks so as not to disturb them. 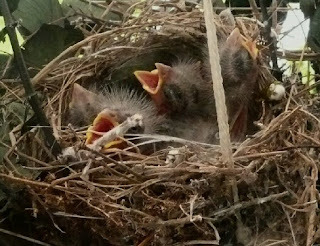 Yesterday I got an excited note that her babies had hatched. She took some pictures from inside the door. Here is a face that only a mother could love. 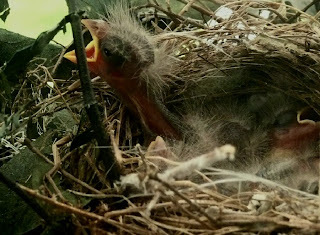 Congratulations Glenda, you are a grandmother. A colorful costume from a Tulsa Powwow. Enjoy! 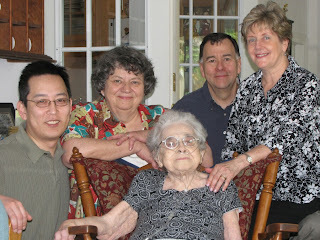 Mark, Susan, Alan and Virginia with Marjorie, the clan matriarch. We have a house full of family this weekend. Susan's brother Alan and his wife Virginia came from Eastern Maryland, and her son Mark came down from Chicago. We are having a nice dinner today to celebrate Marjorie who is Susan and Alan's mother. 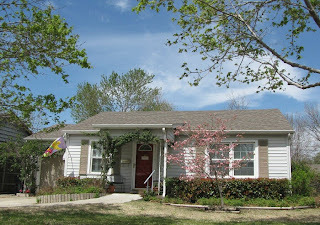 Marjorie lives in a retirement facility here in Tulsa, and Alan and Susan are her only children. Marjorie will be 90 in August. It is especially nice for Mark and his uncle Alan to get together because their paths have not crossed since Mark's wedding 9 years ago. Susan has made a nice pork roast with all the trimmings. 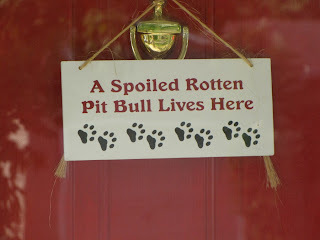 The sign on the door announces this as the home of Smokey. 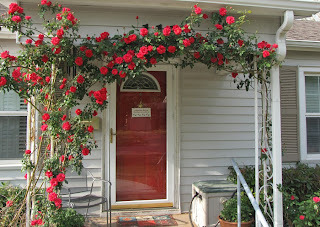 I planted this climbing rose variety "Blaze" to enclose the entrance to our house. There is another on the other side which will grow to meet the first one and complete the arch over the front porch..
A couple of weeks ago When I posted a photo of the full moon, Zhu commented that she really loved a crescent moon. I promised her a picture of one and here it is. I have to admit that I did not take this photograph, it is part of an excellent article from Space.com that my favorite nephew Glen sent to me today. 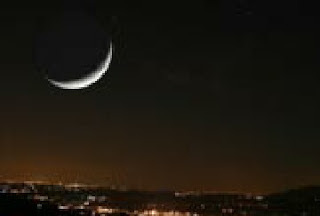 It explains just what a new crescent moon is and how to see it in the next few evenings. Look to the west an hour or so after sunset and you should be able to see the crescent moon, the star cluster The Pleiades, and even the planet Mercury. Click on the photo above and read all about it. Zhu, I promised you the moon and here it is. These have been nice for a week or so, but they will start to fade in another few days. It is starting to get warm and they like cooler weather. This is what is blooming in my back garden right now. Other things will replace them soon. The idea is to have something blooming all the time. The shrub rose is a relatively new variety. I planted these about 3 years ago to make a screen along the side yard. At the time the fence along this side was chain link and Smokey liked to run up and down and bark at whatever was next door. The problem was that in doing so he stomped on the roses and broke them down. Mike extended the wooden privacy fence and that eliminated the problem. 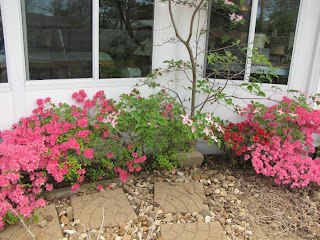 Now that he is not stepping on the rose bushes they are filling in and getting taller. The variety is called Knockout. It is hardy, desease resistant and practically indestructable. It also blooms non-stop all summer until frost. The blooms are not individually showy but bloom in mass. Since I planted these another variety has been introduced that is fuller and a darker red. Not surprisingly it has become a very popular rose for landscape planting. Cars of this vintage look a lot alike just as cars of today do. The most distinctive thing about the cars is often the radiator grill. 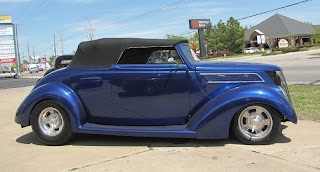 This is a chopped and lowered 1932 Ford roadster. There are a pair of gorgeous Hot Rods sitting for sale at 4320 South Peoria Avenue. It is probably just a "guy" thing but I have always coveted a cool old car like this. I apologize that I can not tell you the original make and year of these cars. If it comes to me I will amend this note. Ah, to be young again. 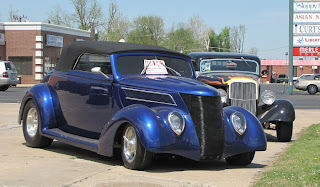 I was in high school in the late 1950s when the hot rod fever first began. Some of these are works of art. They may appeal to our youth, but are generally affordable only by the older guys. Whenever I see one of these on the street, the driver has white hair. By the way, it is unusually warm today in Tulsa. It was 84°F (29°C), and this afternoon at 2 PM It was 96°F (35.5°C)! We seem to have shifted into summer very early. Of course in Oklahoma it could be quite cool in a few days. The bridge looks nice reflected in the water and this is a good place to fish. 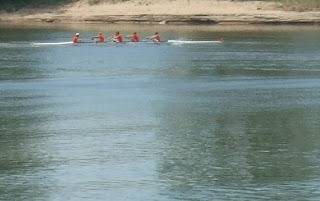 The University of Tulsa and several local rowing clubs practice sculling in long shells. 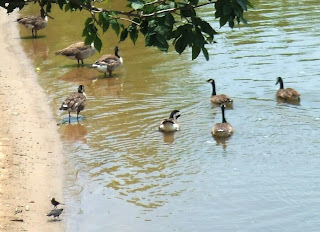 We have a lot of Canadian Honkers who are year round residents in this area. Fifty years ago they migrated through the area but did not stick around. But back in the 1970s there was some concern that their numbers were dwindling and the Corps of Engineers created wildlife refuges on some of the lakes in the area and put out food for them. Their numbers multiplied and rather than move on as expected they stayed around and are now a common sight all year long. If you feed them, they will come. 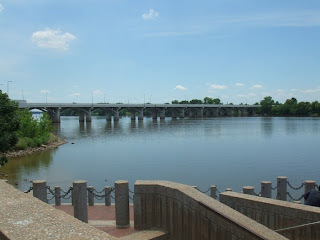 The 21st Street Bridge over the Arkansas river is the location of a small bistro that is to be upgraded this year. 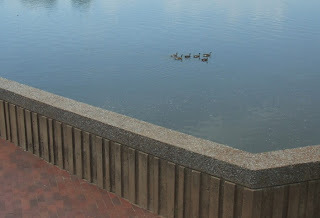 There is a platform where you can fish, or hang out and watch the geese paddle around. Here is Swan Lake again. It is even nicer now that spring is here. 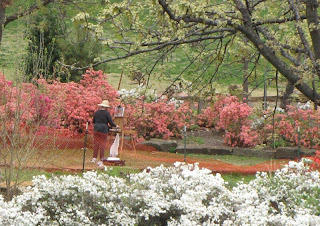 Did you notice the lady painting in the photo below? Smokey and I drove back from our noon meeting by way of Swan Lake and Woodward park. It is such a beautiful time of year, and everything is so colorful that it is hard to take it all in. Rather than sharing a sequence of individual pictures I panned and stitched some shots together with ZoomBrowser to let you see what we saw. 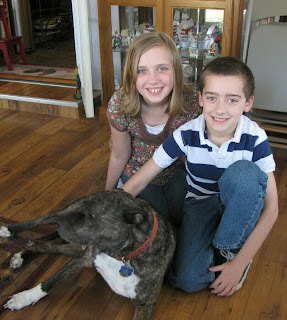 Click on the photos to enlarge and see detail. We have not had a jigsaw puzzle for several weeks, Here are 3 of various difficulty. If you get all 3 there will be a prize! If nobody comments on these I will take the hint and stop posting jigsaw puzzles. ---This one is kind of easy. ---This one is maybe not so easy. The pieces may be turned wrong. Right-click on them to rotate. 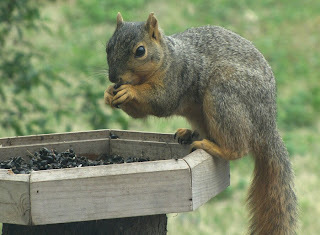 The pan of sunflower seeds is popular with squirrels and blackbirds. 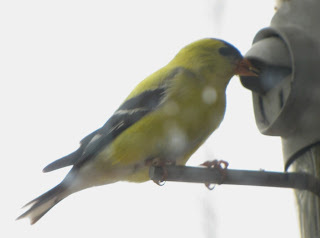 This is not a good photograph as it is against the light and shows the spots on my dirty windows, but the Goldfinch is such a beautiful little bird that I thought I would post it anyway. Yes Anne, they need to be washed. 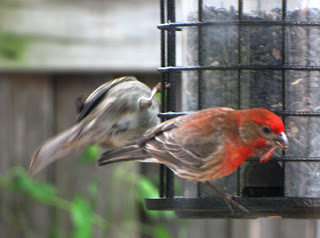 I get lots of different birds but the House Finches are colorful. 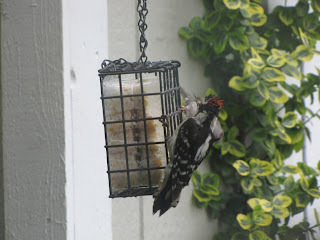 I thought you might enjoy my "Squirrel-Proof" bird feeder. I was working on my computer most of the day and took some photos our the window in the garden room. The feeders are supposed to be for the birds but the squirrels help themselves. I really don't mind because they are so entertaining. There is a pink dogwood tree in front of my house. After sharing so many photographs of beautiful homes with landscaped gardens, I need to confess that our home is by no means so elaborate. We have a very modest home on the budget edge of a very swanky area. 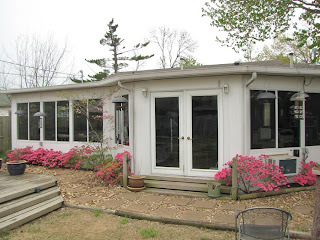 When I moved into this house 16 years ago it needed quite a bit of remodeling and the front and back were totally bare. I have done a lot of work on it both inside and out. 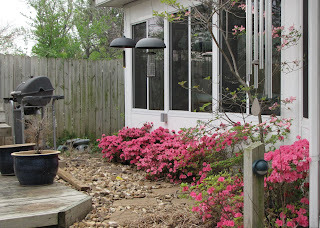 When Susan and I married 6 years ago we added the garden room across the back and have done a lot of landscaping. Now it is still modest, but very comfortable and I think perfect for the two of us, three counting Smokey. I confess that I spent too much time today looking at these video clips. Some of them I have seen before but many of them were new to me. All were interesting. I share them with you in hopes that you will enjoy them. 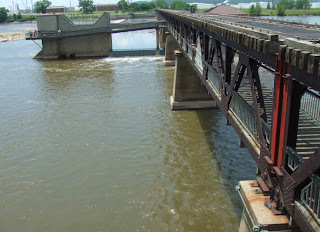 The pedestrian bridge allows foot and bicycle traffic to cross the Arkansas River. There are over 26 miles (42 km) of hard surface pedestrian and biking trails within the River Park which runs adjacent to the river. These connect to many more designated biking trails within the city. Several outcroppings are available for fishing along the pedestrian Bridge. One of several Tulsa railroads now defunct have had their right of way turned into bicycle paths. 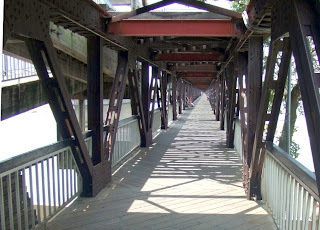 The former Midland Valley Railroad trestle crossing the Arkansas just south of the 21st Street bridge is now a pedestrian crossing. This allows foot and bicycle traffic to cross while others try their hand at the striped bass which have been introduced into the Arkansas. 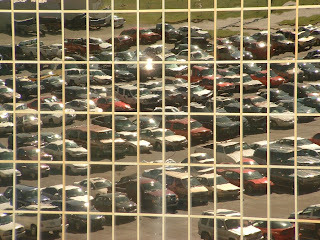 The gold-tinted windows mirror the parking lot. Tulsa's CitiPlex Towers striking architecture is prominent on the Tulsa Skyline. The CityPlex Towers is a complex of three triangular buildings. The central tower is 60 stories, the East tower 20 stories, the West tower 30 Stories. 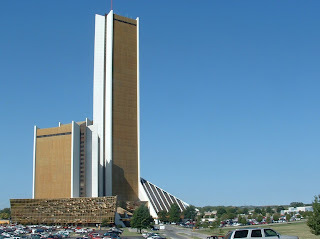 Built near 81st and Lewis in 1981 as the City of Faith by evangelist Oral Roberts, it operated as a medical center and school for 8 years. Since 1989 it has leased space to a number of services, primarily medical offices. I hope you can enjoy a few more spring flowers. 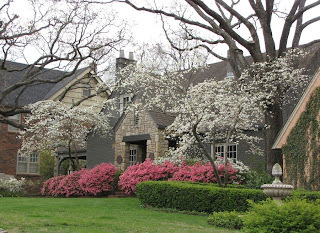 Smokey and I drove back through a beautiful neighborhood today and I could have taken a thousand photographs of dogwood trees and azalea bushes. I didn't take a thousand but I took a lot of pictures and they are all lovely. So I put them in a slide show and you can look at them all or pass on by. I'm really not sure who my audience is. My counter shows that this blog gets 40 or 50 visits each day but only a handful leave comments. Those who comment have become genuine friends and I look forward each day to talking with them. To you I say thank you very much. Enjoy the Neighborhood Tour of Spring Flowers. Christ is Risen Indeed!! The ancient greeting is exchanged every Easter to celebrate the risen Christ. We have a group of ladies who knit shawls to present to various people. 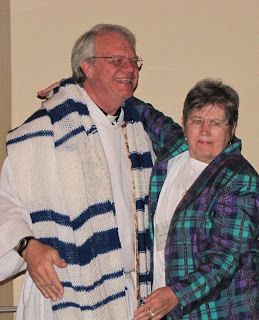 They pray when they knit and the shawl passes that prayer along to the person who receives it. Today they surprised Father Rick with one for himself. He seemed to be very pleased. 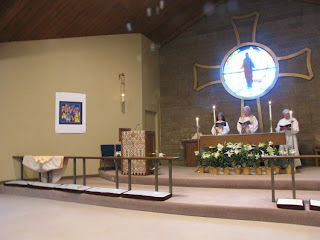 The Eucharist was celebrated and received, our Music Ministry made a joyful noise, Eggs filled with candy were discovered by the children, and the service was followed by a pot luck brunch. We were fed body and soul. Christ is risen, He is risen indeed! I sincerely wish everyone who reads this a very blessed Easter. Whether you are a believer or not, I pray your life be blessed this day and every day. Happy Easter!! Here is a Slide Show of Today's Activity. We enjoy a great breakfast at the Blue Dome Diner. 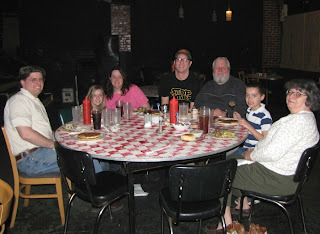 From left to right are: Jeff, Molly Jennifer, Chef Luke, Bill, Willy, and Susan. Susans daughter Jennifer and her husband Jeff, grandchildren Molly and Willy drove down last night from Missouri to spend the Easter weekend with us. It is very nice to have family with us for the holiday. 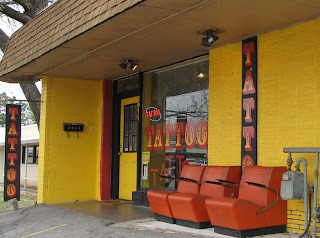 One of Tulsa's Tattoo Parlors. Tacky but colorful. Until last year it was not legal to operate a tattoo shop in the state of Oklahoma. Why? This is a very conservative state. How conservative? Oklahoma voted for Republican John McCain by a larger percent than any other state in the union. But now enlightened citizens can get a tattoo without driving to neighboring states Kansas, Arkansas, or Texas. The fact that Oklahoma is even more conservative than Kansas, Arkansas, and Texas is a sobering thought for a liberal Democrat. For all that, it is a great place to live and I love it. Golf Ball Sized Hail ! !